I’m a corporate lawyer in New York City, which actually gives you the discipline to fight through some of the harder searches. How much time do you typically put in for each contest? It varies. I typically spend 10-15 minutes just analyzing the image and on occasion, as with last week’s Mostar view, the answer pops right out. But for difficult ones, and if I have time, I can spend several hours over the course of the weekend. In those cases, as with writing, it makes sense to work in small stretches and come back with fresh eyes. What was your all-time favorite VFYW contest? 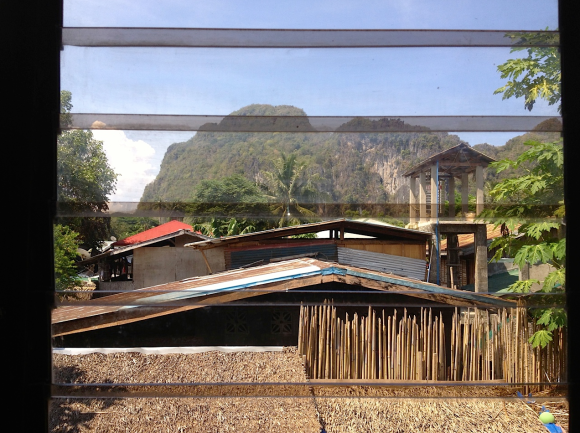 Well, in terms of the ones I’ve found it would have to be the El Nido view in the Philippines (VFYW #153). Tracking down the actual window required plotting dozens of images from the local cliffs on a time-line. By the end of that process my computer’s desktop looked like the floor of Baker Street after Sherlock Holmes spent a night digging through a stack of old newspapers. The most amusing contest, however, was VFYW #116, which I never found. I normally begin a search by adjusting the image’s brightness and contrast, but when I did so that week, boy was I in for a surprise. I’ll let the readers go back and, er, reflect on that one. What are the most common red herrings? Recently it’s been red tile roofs. Whenever we get a Mediterranean view, there’s invariably a group of readers who think it’s California because of those roofs, but it rarely is. More broadly, certain architectural characteristics, like shanty construction, are common across a wide swathe of the planet, but people tend to assume they’re specific to regions they’ve previously traveled to. Unless you’re certain, I think it’s better to cast a wide net at the beginning of the search rather than develop tunnel vision. Do you ever reach a point with some contests when you just admit to yourself that you’re stumped and give up? Not really, because I rarely push too hard for an extended stretch of time. Instead, I’ll plug away right up to the deadline with whatever snatches of free time are available, even if it means searching on the elliptical at the gym. Which VFYW victory were you most proud of? That’s a hard one. Cork (VFYW #117) comes to mind first, as I found it just as I was about to turn the computer off for the night. And the Rohrmoos view (VFYW #148) in Austria required a pure brute-force search because there were no good clues. When I found that one I felt like Rocky running up the steps of the Philly Museum of Art (except swap Stallone with a dork sitting at a computer). What are some photo clues that the average person might not think would be helpful? The most prosaic of details, like garbage cans, traffic signs and chimneys are often fairly specific to a region or country and can narrow down the search area. Also, the position of satellite dishes and the direction of shadows can give you a sense for the compass direction of the picture, which helps when searching satellite imagery. Mike: About eight hours, usually a few hours at a time over Saturday and Sunday. About half my time is typically spent documenting the location. (I did most of the documentation – that’s why my time is longer than Yoko’s). Yoko: It depends… from 15 minutes to the whole weekend. We usually found the window on Saturday morning, otherwise, we couldn’t go out. Typically, 3 hours or so. What was your all-time favorite contest? Mike: Dhaka, Bangladesh. The part I regret is that Yoko was traveling that weekend, so I found it myself. It turned out to be a great win, because it was a solo win – nobody else got the building – but I wish Yoko had been part of it. Yoko: My favorite was Edinburgh. It was a lovely scene. The cobblestone street in the photo helped me find the window. (Note from Mike: Yoko found this window in about fifteen minutes). Mike: #68, Ulaanbaatar. I had found windows before that, but this was the first one Yoko and I solved together. She found the window after we talked about the clues, and I wrote up the entry. Yoko: Dhaka. Mike found the window by himself. Usually, I helped him too much. Mike: Curbs and utility poles. Yoko: Hmm… Electric utility cables (how messy, how old…) can be clues. Also, the window frames sometimes tell me many things. Mike: License plates. There are so many, and they change so quickly. It’s easy to look at a plate and think you know where it’s from (or even to look it up on a license plate site), only to discover that it hasn’t been used for years, or even worse, that the same design is used in myriad countries or states.